If you need to push it, pull it, shove it, or pack it – when it comes to warehousing and forklifts, we have what you need at Lloyds Auctions – for a pinch! You might need a blue card and you’ll probably need a forklift licence to operate this equipment. But, one thing that you won’t need is as much cash as you might expect to purchase our items at auction. Warehousing & Forklift auctions cater to both light and heavy industry, providing equipment for warehouses, factories and industrial sheds along with the machinery needed to rack, stack and pack it. Whether you’re looking for a pallet jack, trolley or heavy duty forklift, this is where its at. Lloyds Auctions sell forklifts suitable for all your material handling needs. We have sit-down rider trucks (electric, petrol, LP-gas, diesel or compressed natural gas) or narrow aisle trucks. We make light work of heavy lifting at Lloyds Auctions. And, you’ll always have more money left over in your pocket. With a wide variety of well-known brands like Toyota and Mitsubishi, we have options for industries of any size. Need to expand your storage space? Lloyds Auctions have all kinds of options warehousing and pallet racking for sale. With the versatility and quality of leading brands we regular auction such as items as cantilever racking, pushback racking, carton storage and workbenches. Auctions provide the cost-effective solution to your storage needs – whether in the home garage, or, at a heavy-duty industrial scale. Lloyds Auctions regularly provide lots of warehousing items for auction to buyers who appreciate the range and quality on offer. Our catalogue does differ depending on what we source at the time but we have a rotation of good for sale, items include: long span shelving, packaging, plastic bins and tub, cabinets, spill control systems, pallet rack accessories and workplace signs. Basically, anything you might need for storage or material handling whatsoever. Our online auctions are the quick and easy option. It only takes a couple of moments to sign up and you can start bidding right away. 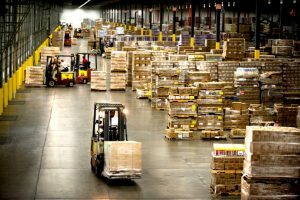 Liquidations, Insurance Claims, Clearances Sales and Business Closures often supply good quality warehouse equipment in perfect working condition. Keep an eye on this category to find storage and shelving solutions, boxes & storage, pallet handling, moving and lifting apparatus. Lloyds Auctions have a great reputation for providing quality equipment at basement prices.